The provincial government has walked away from a highly touted housing project in Regina that would have provided homes for 48 low-income families, because of a contract dispute with the developer. 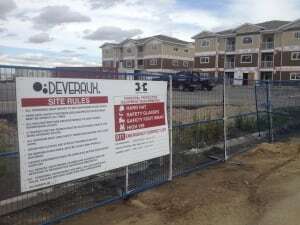 Deveraux Developments agreed to build the units in north Regina's Hawkstone neighbourhood at a fixed price but the company ended up with a cost overrun. The developer asked Sask Housing, an arm of the provincial government, to cover half of that shortfall or the company would keep the project for itself and rent it out at market rates. The province refused to pay for any of the overrun and the deal collapsed. "Deveraux just concluded that it would be better for them to maintain ownership," said Tim Gross, executive director of housing development for the province. And the province decided to let the company do just that. The housing coordinator at Carmichael Outreach in Regina was excited about the new project and said this news "is really disheartening". Doreen Lloyd helps low-income people track down homes in the city and she said that's getting harder every day. Sask Housing has 3,100 low rent units in Regina, but Lloyd said that's of little help to her clients. "In terms of the family programs that are here in the city they're all maxed out. Silver Sage [has a] two year waiting list," Lloyd explained. "So a lot of the affordable housing I don't even get the people to fill out the applications anymore because I know the waiting lists are horrific. We're pretty much reliant on private landlords." On Mar. 21, 2013, the provincial government announced a plan to build the project with Deveraux Developments, featuring two and three bedroom apartments. The press release said "This is the first announcement under the government's plan to reinvest approximately $53 million in new housing for low and moderate-income families through the sale of government-owned single-family units." The new low-income homes would be paid for by selling off 300 old units built between 1950 and 1975. So far, the government has sold 40 of those units in Regina. But because the announced deal fell apart, those low-income homes won't be replaced any time soon. The province entered into a $9.9 million fixed price contract with Deveraux to build the units to guarantee the finished building would be delivered without cost overruns. In the spring, Deveraux notified the province the 48-unit project was nearing completion and had gone about $400,000 over budget. President and CEO of Deveraux Denis Jones told CBC's iTeam the cost overrun was the result of a miscalculation by his company. "That was our mistake," Jones said. Jones said it proved more difficult to build basements in the facility than the company had expected. "We had to go down lower than we anticipated initially," he said. "And we had to change the piling solution and that was an extremely costly overrun." Though it was Deveraux's fault, the company asked the provincial government to pay for half of the overrun — $200,000. "We were trying to get to a point in the project that we weren't going to be losing money," Jones explained. "Our goal was to try and make sure that both parties were not hurt by the change in the contract and we think we found a solution that worked." The province and Deveraux decided the developer would keep the building and rent out units at market rates rather than sell the building to the province as low-income housing. Deveraux has returned the provincial government's $1.98 million deposit on the housing project. "It was still going into the rental pool," Jones explained. "And at the same time we could mitigate some of our losses, so it was a mutually agreed upon transaction." Gross said the province was forced to consider several options in making its decision. It could have paid the $200,000 to cover the cost overrun but "we were concerned about the precedent that would set," Gross said. "We have other projects with fixed price contracts as well and we looked at this long and hard and came to the conclusion that we were better off agreeing not to pay those additional costs." Gross said the province also considered legal action in order to enforce the contract, however it decided against that approach. "Nobody ever wins if you end up going to court," Gross said. "You never know how that may play out." Gross said after long discussions the province decided to walk away from the contract and the buildings. He said in the new year the province will once again put this contract out to tender. "We're looking forward to seeing what kind of submissions we get," Gross said. He hopes the new low-income housing will be built within three years. Lloyd said this is terrible news for low-income people in the city. Government-owned housing is being rented out at a rate that people can afford based on their income, ranging from $326 to $1,375 per month. Deveraux will be renting these units at $1,200 to $1,400 per month. Lloyd says her clients "can't afford $1,500 a month or $1,400 a month rent and to be able to feed and clothe their children on top of that." Lloyd said the housing shortage is growing worse by the day. "The shelters were full all summer. And now the cold weather is coming," Lloyd said.